This pdf clocks in at 5 pages, 1 page front cover, 1 page editorial/SRD, leaving us with 3 pages of content, so let’s take a look! -But I LIKED my Character…: Basically gives you an extra life. Can be used once; but you may take it again. -Dutiful Scribe: Rewards the records keeper by reducing Intimidate and Diplomacy check DCs in settlements where the character’s exploits are known by character level. -Feed the Beast: Rewards player that brings food for everyone; 1/session swift action bite for 1d3 damage (not typed or clarified as per (natural) attack type), with a +20 luck bonus. -Knowledge is Power: Player brings 1+ reference books to share. 1/session use out of game knowledge to identify a creature, obstacle, plot element, etc. -Miniature Monstrosity: Bring an unopened box of minis. During the session, open it and have the mini join the fray as a NPC on the PC’s side. May only be used once, but you may take it again. -Needed Intermission: Player volunteers to run game instead of regular GM. As a thanks, once per campaign, the player can designate a safe rest sans random monsters, etc. -Oath to Play Well: The GM selects rules (like no electronic devices, ruling for now, etc. ), and adherence to these rules provides a massive, usually on HDs, based bonus. I think these bonuses are overkill as presented, though I do like the sentiment behind that feat. It’s part of the concept of the social contracts of roleplaying that I champion. -Well-Equipped: Players with props or objects. Nets bonuses or additional uses of consumables. -What IF…? : Player describes action differently, things happen that way. May be used once, and only once. Battlecry metafeats require that you shout a catchphrase, battlecry, etc. – “Blood, Death and Vengeance!”, for example. 😉 Only one battlecry may be in effect at a given time. -Cooperative Harassment: When a PC fails a combat maneuver, one ally that also threatens the target may attempt the same maneuver as an immediate action. Cool! -Group Gangpile: All allies gain the character’s teamwork feat. No range, no maximum limit of allies. Broken. -It Has to Hit: Once per character per combat, each ally may add a +1d6 surge to atk if it misses, potentially rendering a miss into a hit. This is a massive upgrade. -Magic is Might: Once every other round, the PC may cast a spell as a swift action, provided it has a casting time of 1 round or less, and that the character has not used their standard action to cast another spell. Other actions are game. Do I need to say anything? -NOOOOOOOOO! : Wounded ally immediately stabilizes and gains character level temporary hit points; also make a single attack at highest BAB against the target that struck you down. You may dra a weapon and throw it to do so. -Wabba Wabba: Character generates a rod of wonders effect. Editing and formatting re very good on a formal level. Layout adheres to a two-column full color standard, and the pdf has no artworks or bookmarks, but needs none at this length. Joshua Hennington’s metafeats are a really tough nut to review. Perhaps I’m spoiled by my players and their commitment, but I do tend to think that many of the positive behaviors that these try to help you enforce should be a self-evident component of the social contract that is roleplaying. The goal of these metafeats then, would be to basically educate players to be good players…but personally, I think that the at times massive bonuses granted here are a) overkill and b) generate a sense of entitlement that can be rather grating. In short: Before you resort to the methods of using metafeats, just talking to your players may be the wiser move – after all, you’re all trying to have fun together. This is a personal opinion, though. As far as my reviewer’s perspective is concerned, I have an issue with the precision of a few of these feats; I don’t like that we don’t get more nuanced guidelines for the awarding of metafeats, and the internal balancing of these feats is all over the place. A 1d3 true strike’d bite 1/session? Versus infinite temporary hit points? There is no guiding principle regarding the power levels of these metafeats, making them all feel like the thing they truly are: House rules. These are feats in name only; they are not really adjusted and unified regarding power levels of benefits bestowed. And honestly, none of them are really that unique. Their concepts are an idea worth exploring, but some of the benefits are frankly broken and would have required more precision. I expected more. 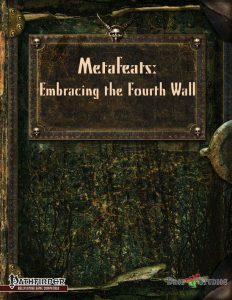 And it’s not that I don’t like 4th-wall breaking stuff once in a while – Rite Publishing’s Metadventurer, for example, is a great example of how you can make that work. This supplement, though, will, in spite of the great idea, languish within the depths of my HD – it’s just not refined and well-balanced enough to warrant inclusion. My final verdict will clock in at 2.5 stars, rounded down.